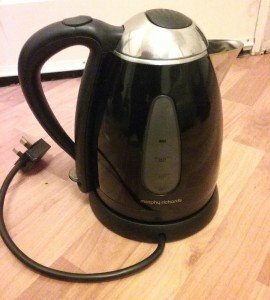 A black and stainless steel 1.5 litre Morphy Richards electric kettle. 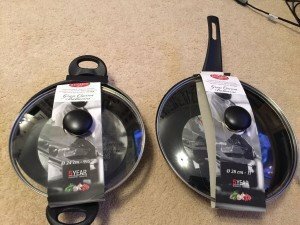 A brand new in packaging non-stick lidded frying pan, together with a matching lidded two handled wok. 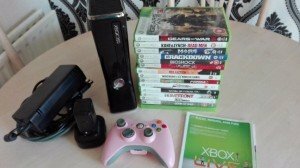 A black slim Xbox 360, together with a pink covered joypad and various action games. 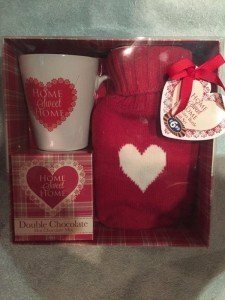 A brand new boxed red gift set, to include a home sweet home large coffee mug and a heart hot water bottle. 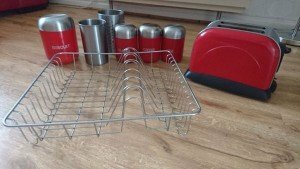 A collection of red and stainless steel kitchen accessories, to include a dish drainers, tea, coffee and sugar canisters, a biscuit tin, two utensil pots and a two slice toaster. 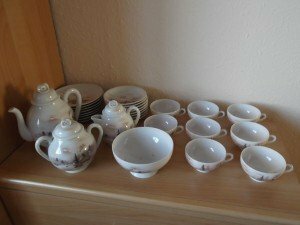 A shabby chic style part dinner service, to include dinner plates, side plates, a milk jug, bowls, cups, saucers etc. 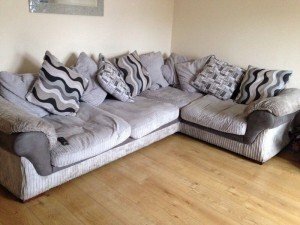 A large four seater corner sofa on mahogany square feet, upholstered in grey cord velour with various patterned and plain backing cushions. 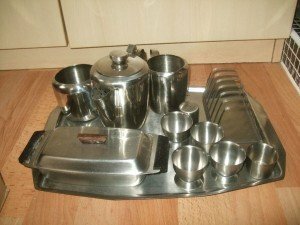 A stainless steel retro breakfast set, includes a large serving tray, a lidded butter dish, a coffee pot, a milk jug, sugar bowl etc. 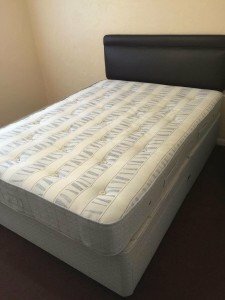 A black faux leather double bed frame with two underneath storage drawers on either side, together with a double spring mattress. A large Japanese Oriental tea set, comprising of three various size teapots, eight cups, eight saucers, eight dinner plates and a serving bowl, decorated with forest scenes. 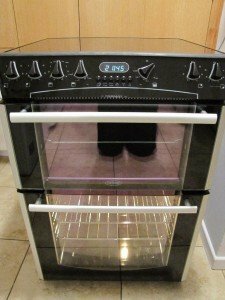 A black stainless steel and glass Beling electric halogen double oven, with a four ring ceramic hob. 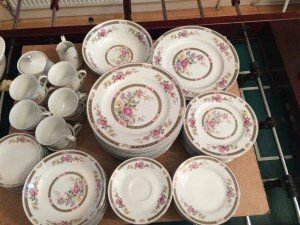 A 63 piece Denby Greenwich green dinner/ tea service, comprising of 5 platter serving dishes, 2 lidded casserole dishes, 3 serving bowls, 2 gravy boats and saucers, a coffee pot, a teapot, a jar, 4 dinner plates, 16 bowls, 3 side plates, 6 mugs and saucers, a sugar bowl, two cream jugs, a water jug and salt and pepper pots. 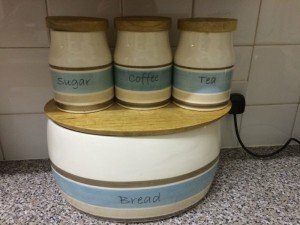 A four piece ceramic kitchen set, to include a bread bin, a tea, coffee and sugar canister set, each with a wooden lid. 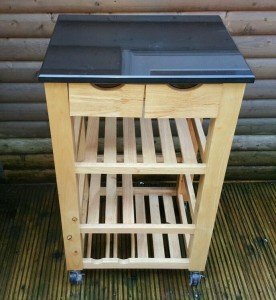 A solid pine kitchen island with a black work top, has two drawers with three shelves underneath, on castors. 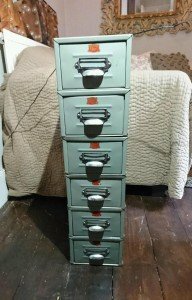 A shabby chic tall standing chest of metal locker drawers, hand painted in duck egg blue, comprising of six drawers. 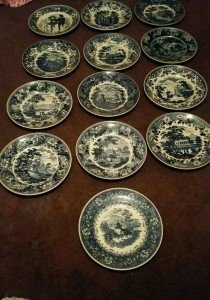 A set of thirteen oriental style Wedgewood cabinet plates, decorated in a blue and white floral border with various town scenes to the centre. 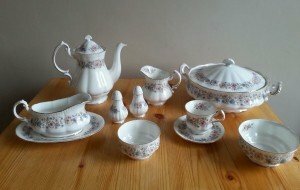 A vintage porcelain part tea and dinner service, to include a teapot, a mil jug, a sugar bowl, salt and pepper shakes, a gravy sauceboat with tray, a litter casserole dish, a bowl, a tea cup and saucer, all decorated with a girly floral design. 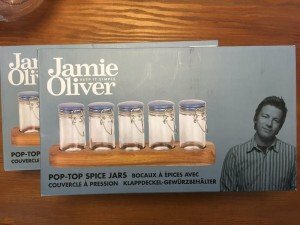 Two brand new boxes of Jamie Oliver spice jar sets, each box containing five blue lidded glass jars on a wooden stand. 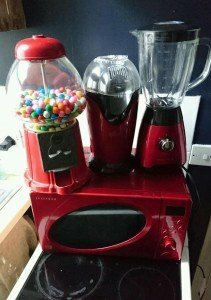 A collection of red and black kitchen accessories, to include a large gum ball dispenser, a blender, a juicer and a microwave. 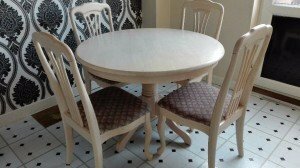 A light wood farmhouse style round dining table on splayed feet, together with four matching high back dining chairs upholstered in damask printed fabric.